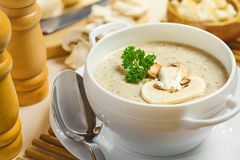 A smooth and delicious soup with a wonderful combination of mushrooms and cream that everyone is sure to love. In a large sauce pan/ dutch oven add 1 tablespoon of butter and onion. Stir on medium heat until onion turn soft and translucent. Add mushrooms, salt, black pepper along with 1 more tablespoon of butter. Cook until mushrooms turn brown. Now add the remaining butter and flour. Mix well and add stock. Simmer the mixture for about 10 minutes or until it thickens. Blend it with an immersion blender. After blending slowly pour the cream and cook for the last 2-3 minutes. Remove the pan from heat and serve.